A quick review of the benefits of Dynafit's brilliant Alpine Touring bindings will likely make you wonder why anyone would ever want to use anything else. To start with, they're light: wonderfully, magically, impossibly light (as low as 1 pound 4 ounces per pair for the brakeless TLT Speed). Along with being the lightest A/T binding by a mile, Dynafit also offers the most natural kick-n-glide stride, a free flexing ski underfoot for silky-smooth downhill performance, and a rigid, slop-free ski-binding-boot interface for Alpine-quality control. Obviously, since Fritschi is still in business, there must be a catch. Dynafit bindings shed weight by using your ski boot as an integral part of the binding. This requires you to use boots which are specially designed to be compatible with Dynafits: an ever-expanding list which includes most of today's A/T boots. A Dynafit-compatible boot features two little holes built into the boot's toe and heel, into which go the binding's small metal lever arms, which lock the boot into place. Release the heel, and the toe becomes the pivot, allowing freeheel climbing—and even a variable-height heel elevator, by rotating the rear binding piece. The design is a marvel of simplicity and function. Long-time Dynafit users tend to be passionate about their bindings. First-time Dynafit users can be equally passionate in their frustration. Unlike the mindless ease of snapping into a step-in binding, getting into Dynafits can be something of an adventure—especially in challenging conditions. In some conditions the 'tech' holes in your ski boots will tend to fill with dirt and ice. If the holes are partially blocked when you snap in to the binding, it's possible the bindings will engage but not fully lock, leading to a sudden and unexpected prerelease on the descent: not good. This is perhaps the single greatest liability of the Dynafit system, requiring care each time you snap in to ensure you actually are...snapped in. My first experience with Dynafits came not as a user but as a spectator: I watched someone trying unsuccessfully to step into their bindings, clicking out immediately each time afterward. Now imagine yourself in the scene, wearing a heavy backpack, in deep snow, getting madder by the minute. On the other hand, that same day I watched an experienced Dynafit user get into his bindings with no problems in horrendous conditions: a whiteout, 60-70mph winds, on a steep angle. The lesson here is clear: you have to learn how to use these bindings. 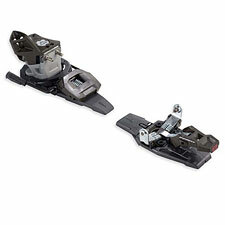 Due to the mechanical simplicity of the interface, Dynafits provide an enviably stiff connection, eliminating the toe 'slop' or wiggle so common to Alpine Touring Bindings. Be warned, however, that this 'secure' connection is a bit illusory. The Dynafit's release mechanism is primitive compared to practically any other modern binding. If you are interested in maximum safety to protect your knees in a fall, this binding ain't it. I would not recommended Dynafit for frequent in-bounds skiing, though of course many people would scoff at that restriction. On the other hand, Dynafits rarely break to the point of losing structural integrity, making them an outstanding choice for expeditions or other contexts where a breakdown could be catastrophic. In practice I've found the Dynafit's easy to get used to, and easy to use. They are not a true step-in binding, but they aren't as far away from the simplicity of a step-in as you'd expect. My greatest reservation about the Dynafits remains using them in situations where you must put them on while standing in the midst of extreme terrain. But I should mention that Dynafits have earned the trust of many top ski mountaineers, including Andrew McLean. In any case, if you can live with the binding's inherent quirks, you'll find their benefits hard to beat in practically any backcountry context—especially as you trend toward multi-day or expedition skiing where weight matters above all else.